Clarence (Cal) Palmer was born in Christchurch on 23 September 1895. On his enlistment into the army in June 1915 his occupation was described as labourer, which a descendant believes was with a Christchurch butchery business. 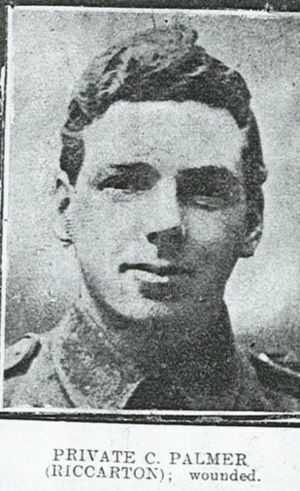 Cal enlisted in the army on 14 June 1915 (aged 20 years 9 months) and discharged on 6 June 1919. He served in Egypt, Egypt EF and Western Europe. Verbal family history recounts Cal was a gunner on a front line, during which time he lost an eye due to shrapnel. The family story is that Cal was patched up and sent back to the front line. Following his discharge, Cal settled in Temuka with his wife, Dolly (Cecilia). They purchased a house on the corner of Guise Street and Domain Avenue. My understanding is that the property was initially a half acre, later being reduced to a quarter acre. Cal lived there the rest of his life - as did Dolly until she moved to a rest home toward the end of her life. As young children his grandsons would visit Cal and Dolly at their Guise Street home (still standing in 2018). They would be enthusiastically welcomed. Occasionally they asked him what the war was like. His reply never really varied. "It wasn't good lad, it wasn't good." The family recount that during the years of the great depression Dolly once said she could make eggs and milk go further than could be imagined. They also recall they were frugal people, but with a half acre they may have grown much of their fruit and vegetables in their own garden. Cal spent much of his working life as a cheesemaker for the Temuka Cooperative Diary Co Ltd from around August 1921 to 30 June 1931 when the business was discontinued. In July 1932 Cal was working at the Waimate Cooperative Dairy Co Ltd. In 1935 his occupation was given as the manager of the company. How he traveled there is perhaps a mystery – there is no family history or story of him ever living there. He may have had a car, but his grandson only recalls that at one point after retiring he purchased a new Morris Minor and was very proud of it. Cal died on 1 October 1984, and is buried in the Temuka Cemetery.